Techne 3 Prime Base thermal cycler (PCR), supplied with a block for 15 x 0.5ml microtubes. (120/230V 50/60Hz). The Prime range of thermal cyclers are also designed to provide easy programming. Pre-installed templates allow the user to quickly create even the most complicated programmes via the intuitive touch interface. All Prime thermal cyclers have the ability to transfer programmes between instruments via USB or to your PC. The internal memory can hold 1000 programmes with unlimited storage available on USB data stick. Techne 3 Prime Base thermal cycler (PCR), supplied with a block for 96 x 0.2ml microtubes. (120/230V 50/60Hz). 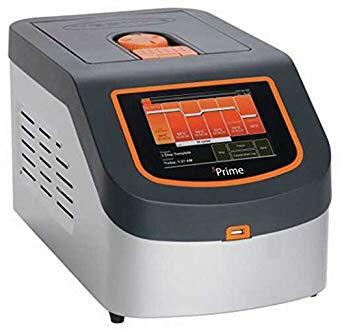 The Prime Pro 48 real time qPCR system is a new, high specification, economically priced real time thermal cycler from Techne. Made in the UK, the Prime Pro 48 features the highest thermal block uniformity and fastest run time of any block-based qPCR system on the market. unique heating and cooling system that quickly cycles from one temperature to the next and then achieves a uniform ±0.1°C in every well of the block within a fraction of a second of reaching each dwell temperature. No other block-based qPCR system can achieve similar performance. 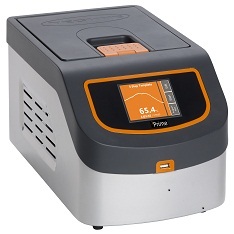 The capacity of Prime Pro 48 accommodates a unique and economical 48-well qPCR plate. The well format mirrors a 384-well plate therefore allowing the use of 16-channel pipettes. The small qPCR plate cuts reagent costs in half whilst still producing a strong fluorescence signal. Minimizing the plate size also significantly improves thermal uniformity and greatly reduces run times. • 40 cycles in 40 minutes before optimisation. • 40 cycles in 15 minutes when optimised. • Genotype in 4 minutes with over 99% accuracy. • Set up a 4plex reaction in only 4 mouse clicks. • MIQE compliant - always consistent, always compliant. • Instant settle time to achieve world leading uniformity of ±0.1°C across the block - any well, any instrument - consistent results in any system. • 400 analyte specific qPCR reagent kits available. • Demo equipment available to evaluate in your own lab. • Consistent results provide trust and confidence. Well-to-well, run-to-run , machine-to-machine. • Compile data from multiple experiments. Pool plates and results across labs and instruments. • Record every well, with every filter, in every cycle. Never miss a data point. • Adaptive LED Control means you never have uncertainty of saturated unknowns, no bleaching though light to neighbouring wells or maximising the wide dynamic range. Trust results are correct. 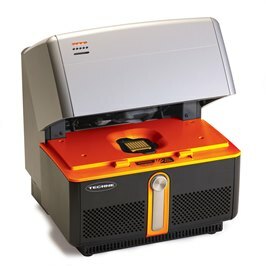 • All other block-based qPCR machines have lower uniformity. If you perform Next Generation Sequencing, any other instrument than Prime Pro 48 is risking your NGS, with significant cost implications. • No other qPCR system offers so much performance for such a low price. • Available as a complete system - Techne instrument, plates, seals and reagents. • Alternatively, is chemically open platform - use your preferred supplier reagents. • Lowest price per run - use duplicates and low sample volumes. Don't waste money with triplicates and large sample volumes. • Everything as standard - no add-ons, HRM as standard, unlimited software licence. • Highly accurate and uniform qPCR prevents means successful NGS runs and significant moneysaving. • Unsurpassed block uniformity with patented block technology enables the researcher to use duplicates on Prime Pro 48, whereas triplicates are required on less uniform competitor machines.